ABBA NAZARIAH, worldwide head of Essene Church of Christ says, "Peace be with you!". ESSENE TEACHINGS ON ETERNAL LIFE. What happens when you die? In a newly recovered Essene scroll, Jesus teaches the mysteries of life and death, including how to enter the heaven of this planet, an Edenic realm called El Kush, and how to enter even higher heavenly abodes including the ultimate: HEAVEN MOST HIGH. Heaven may begin within you, but it is also a VERY REAL abode in which angelic beings of light live, work, and play. This info will transform your life! Nazariah will also hold a question/answer session on the Essene teachings, answering your questions. Nazariah is a spiritual leader in the Essene community. He serves as the world-wide head of the Essene Church of Christ, the only church to advocate that its members adopt a raw food vegetarian diet. Nazariah emphasizes the connection between raw food and spirituality. A raw food diet increases one's clarity. It leads to mental and emotional equilibrium, which in turn permits a person to go deeper into meditation. Nazariah is the Grand Master of Essene Reiki and the Melkizadek (High Priest) of the Essene Mystery School of Mount Carmel and Alexandria in Exile. Based in Eugene, Oregon, he recently opened congregations in San Francisco and Santa Cruz, California. He also has a congregation in Portland, Oregon. The founder of Essene Church of Christ is Rev. Dr. David Owen, known by the initiatic name "Nazariah". "Beloved Friend, listen well. You shall do a special work for me. Indeed, you will be a bright sun by which my true teachings shall be illuminated. You will cast light on teachings of mine long suppressed by the merchants of death. Your life will be a blessing to many beings, human and non-human alike." "But first you must be trained: When the time is right, I will send a holy one to train you. You will know him when you see him: The eyes are the windows of the soul, and his eyes will reveal a gentle soul. He will radiate peace. When your training with him is through, you and I shall again embrace: This time I came to you; next time you will come to me." At age 17, Nazariah met the "holy one" sent by Jesus to train him: an elderly Essene Master known by his spiritual title "the Zadek". Nazariah dedicated his life to spiritual practice; he became a full-time student of the old Essene Master. At age 18, Nazariah helped the elderly Essene Master form an Essene monastic community on 35 acres of Eden-like land in the mountains east of San Diego. Using recycled materials, Nazariah and Infinity built a dozen cabins and other buildings; soon, "Essene Garden of Peace" was a thriving monastic community. During the seven years he lived in the Essene monastery (age 18 to 24), Nazariah was thoroughly trained in all major yoga systems (Hatha Yoga; Gnana Yoga; Raja Yoga; Bhakti Yoga; Karma Yoga; Laya Yoga; Mantra Yoga; etc.) with heavy emphasis on the most comprehensive, wholistic yoga system of all: The Essene Yoga known as "The Essene Way". 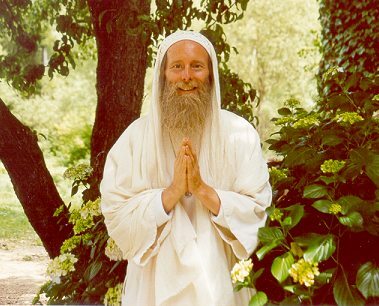 Nazariah spent several hours per day (beginning each day at 4 a.m.) in spiritual study and yogic practice; the rest of each day was devoted to work in the organic garden and management of a recycling business. His diet was 100% straight from the garden: raw, fresh, organic vegetarian food. He fasted often during that seven-year period. As a result of his studies and practices, Abba Nazariah became very clairvoyant, had profound out-of-body experiences and gained recall of past lives (including a previous incarnation as an Essene 2,000 years ago). He realized that the primary purpose of his current incarnation is to help in the remanifestation of the ancient Essene Church of Christ at this cusp between ages. After seven years in the Essene monastery, Nazariah moved to the city to launch the work he had been trained for. Nazariah became a resident counselor at a shelter (which he helped start) for homeless women and children located in a Chicano "barrio" near downtown San Diego. Blending the Essene teachings with the Gandhian techniques of "satyagraha" and "sarvodaya", Nazariah launched many programs for the uplift of the community: as a result, he was dubbed "The Gandhi of San Diego" by the national media and was the subject of dozens of television, radio and newspaper stories. After completing the religious studies program at San Diego State University, Nazariah accepted a full scholarship to attend Bethany Theological Seminary near Chicago. After leaving the seminary, Nazariah moved to Oregon where he founded Essene Church of Christ. Abba Nazariah currently serves as Archbishop of Essene Church of Christ, helping to plant branches of the church the world over. He operates an Essene Ministerial Training Program. He is the host of a public access television show called, The Essene Teachings with Nazariah.